It's available at the Senate Finance Committee's website. Click here for video and written testimony and statements. Congrats to Chuck Blahous on coming through so well. "The EBRI Retirement Readiness Rating:™ Retirement Income Preparation and Future Prospects"
The EBRI Retirement Readiness Rating™ was developed in 2003 using the EBRI Retirement Security Projection Model® (RSPM) to provide assessment of national retirement income prospects. The 2010 update uses the most recent data and considers retirement plan changes (e.g., automatic enrollment, auto escalation of contributions, and diversified default investments resulting from the Pension Protection Act of 2006) as well as updates for financial market performance and employee behavior (based on a database of 24 million 401(k) participants). This paper presents the results of the 2010 update. The baseline 2010 Retirement Readiness Rating™ finds that nearly one-half (47.2 percent) of the oldest cohort (Early Baby Boomers) are simulated to be "at risk" of not having sufficient retirement resources to pay for "basic" retirement expenditures and uninsured health care costs. The percentage "at risk" drops for the Late Boomers (to 43.7 percent) but then increases slightly for Generation Xers to 44.5 percent. Households in the lowest one-third when ranked by preretirement income are simulated to be "at risk" 70.3 percent of the time, while the middle-income group has an "at-risk" level of 41.6 percent. This figure drops to 23.3 percent for the highest-income group. These numbers are generally much more optimistic than those simulated for the same groups seven years earlier. In 2003, 59.2 percent of the Early Boomers were simulated to be "at risk," as well as 54.7 percent of the Late Boomers and 57.4 percent of the Generation Xers. When the simulation results are classified by future eligibility in a defined contribution plan, the differences in the "at-risk" percentages are quite large. For example, Gen Xers with no future years of eligibility have an "at-risk" level of 60 percent, compared with only 20 percent for those with 20 or more years of future eligibility. The model simulates a distribution of how long retirement money will cover the expenses for Early Boomers (assuming retirement at age 65). A household is considered to "run short of money" if their resources in retirement are not sufficient to meet minimum retirement expenditures plus uncovered expenses from nursing home and home health care expenses. While knowing the percentage of households that are "at risk" is obviously valuable, it does nothing to inform one of how much additional savings is required to achieve the desired probability of success. Therefore, this analysis also models how much additional savings would need to be contributed from 2010 until age 65 to achieve adequate retirement income 50, 70, and 90 percent of the time for each household. While this concept may be difficult to comprehend at first, it is important to understand that a retirement target based on averages (such as average life expectancy, average investment experience, and average health care expenditures in retirement) provides, in essence, a retirement planning target that has approximately a 50 percent "failure" rate. Adding the 70 and 90 percent probabilities allows more realistic modeling of a worker's risk aversion. "Lowering Social Security's Duration-of-Marriage Requirement: Distributional Effects for Future Female Retirees"
A number of alternatives to Social Security's auxiliary benefit system have been proposed in the context of changes in American family and work patterns. This article focuses on one modification therein - lowering the 10-year duration-of-marriage requirement for divorced spouses. Using a powerful microsimulation model (MINT), we examine the distributional effects of extending spouse and survivor benefit eligibility to 5- and 7-year marriages ending in divorce among female retirees in 2030, a population largely comprised of baby boomers. Results show that the options would increase benefits for a small share of female retirees, around 2 to 4%, and would not affect the vast majority of low-income divorced older women. However, of those affected, the options would substantially increase benefits and lower incidence of poverty and near poor. Low-income divorced retirees with marriages between 5 and 9 years in length and a deceased former spouse face the greatest potential gains. "The Effect of Social Entitlement Programs on Private Transfers: New Evidence of Crowding Out"
We use the introduction of a large social security program in Taiwan to estimate the effect of an exogenous increase in government transfer payments to the elderly on the private transfer behavior of their adult children. Using the Panel Study of Family Dynamics (PSFD), a nationally representative dataset of Taiwanese households for the years 2002, 2004, and 2006, we adopt an instrumental variables (IV) strategy that accounts for the endogeneity of receiving public transfers. Our empirical results show strong evidence of crowding out on the extensive margin (the probability of providing a positive transfer), and weaker evidence of crowding out on the intensive margin (the amount of the transfer conditional on it being positive). The right reason for saving Social Security is to reassure all Americans that this hugely successful program is solidly funded and will be there for the millions who depend on it when they need it. That such action will make a modest contribution to reducing long run deficits is a serendipitous by-product, not the central motivation. The reason for acting now rather than later is simply that the sooner we act the less drastic adjustments we have to make. These adjustments can involve revenue increases, future benefit reductions (including retirement age changes), or some of each. They need not be large if they are done soon and they need not have a significant effect on those currently retired or close to retirement. Should public sector workers be shifted into Social Security? Maybe, but not because it would pay them higher benefits. See my article over at The American, AEI's online magazine. 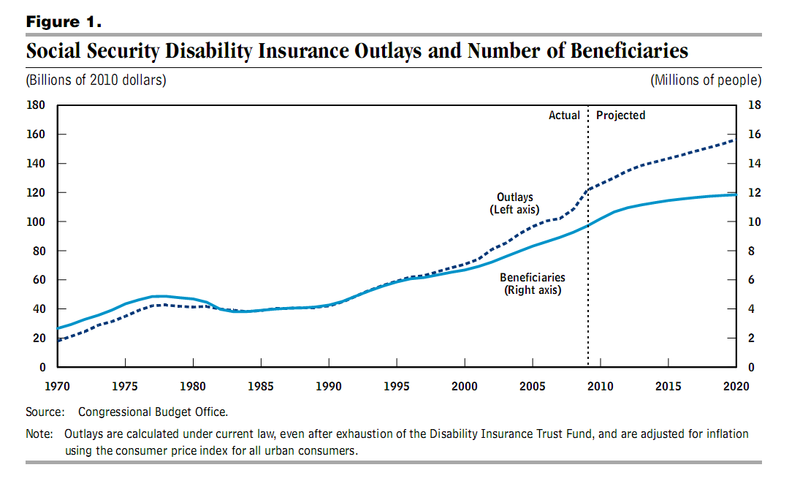 The Congressional Budget Office has released a new analysis of rising claims for Social Security disability insurance (DI). 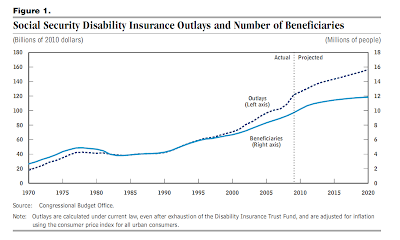 The paper has a particularly helpful run-down of the long list of factors that contribute to the increase in disability claims, ranging from the aging of the population, to looser eligibility standards, to declining wages for low earners. A very good summary of the issues and literature on the subject. Also see a blog post on the paper by CBO director Doug Elmendorf. 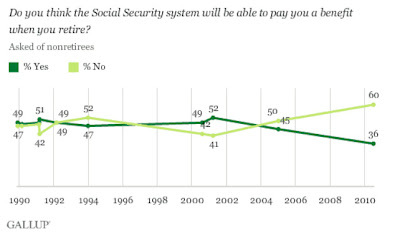 Is American’ lack of faith in Social Security due to conservative scare tactics? This paper compares the differences of individual coverage in the fully-funded social security systems of three Latin American countries. Chile, Columbia, and Mexico each have defined contributions social security systems, yet there are significant differences in system design and incentive that may affect individuals' participation. Here, we examine social security coverage by comparing the system design, economic performance, and labor market structure of each country. We consider the different macroeconomic paths and labor markets structures of each country, especially those regarding the informal labor sector. Micro-data is also used to examine how personal and household characteristics affect the social security system participation. For Colombia, only cross-section estimations are carried out, while panel data for Chile and Mexico allows control for unobserved heterogeneity. Our study reveals the low coverage rates of each social security system is strongly related to economic cycles and the lack of compulsory contributions to the system by self-employed workers. We find a higher probability to contribute to the system for men, head of households, higher number of household members, married, and higher levels of education. Also, females with high levels of education are more likely to contribute to the social security system. The use of target-date funds (TDFs) in 401(k) plans has increased rapidly in recent years. The percentage of all 401(k) plan participants using TDFs increased from 25 percent in 2007 to 31 percent in 2008. One of the reasons for this growth is that TDFs have been a popular choice for the default fund when 401(k) plans have an auto-enrollment feature. Consequently, use of these funds has been found to more likely occur among younger participants, participants with lower account balances, and participants with shorter tenure at their current job, as new workers are the most likely to be auto-enrolled in their employer's 401(k) plan. This paper examines the persistence of use in TDFs among those who were using these funds in 2007. Therefore, the percentage of participants who remain in these plans is determined, as well as the percentage of participants who added TDFs among those not already using them in 2007. The analysis is focused on 401(k) participants who were in plans that offered TDFs in 2007 to see whether they remained in TDFs, moved out of TDFs, or moved into TDFs if they were not already using them. The PDF for the above title, published in the July 2010 issue of EBRI Notes, also contains the full text of another July 2010 EBRI Notes article abstracted on SSRN: "The Early Retiree Reinsurance Program: $5 Billion Will Last About Two Years." Despite the broad and deep reliance on Social Security benefits, very few of the hundreds of millions of current and future beneficiaries understand how the program works. This article presents through a hypothetical couple some of the basic concepts of the Social Security benefits formula. "Revisiting Retirement Withdrawal Plans and Their Historical Rates of Return"
This paper examines the historical record of the so-called 4% rule, the popular guideline for sustainable real annual withdrawals in a self funded retirement. Our findings indicate that a withdrawal plan following this rule ("4R") carries an historical risk of failure for a long retirement that is much higher than generally acknowledged. For example, we find that 15% of the historical 35-year retirements failed when funded with equal parts of stocks and bonds. The "real" withdrawal plans that generated no historical failures were all less than 4%, sometimes far less, when retirements exceeded 25 years. The historical failure rates that we find for a 5R plan are higher than a 4R plan by a factor of at least three for all retirement periods. The historical failures are not random. Rather they occur in clusters of years in which the majority of new retirement withdrawal plans fail. A key driver of these failures was a rapid, significant and lasting increase in the rate of inflation - this event increased withdrawals and contributed to a declining real rate of return that was ultimately unable to support the withdrawal plan. Our review of the prior literature and a detailed description of the methodology used in the study appear at the end of the paper, after the Summary and Conclusions section. writes about a Social Security Inspector General's report on the payment of benefits to public sector workers who have pensions from non-covered employment. 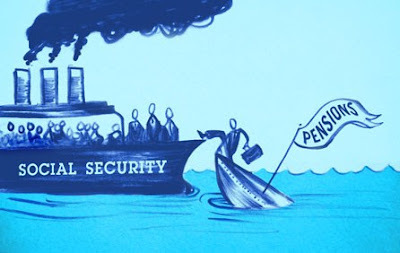 Social Security has two provisions – called the Windfall Elimination Provision and the Government Pension Offset – that are designed to adjust benefits for people who receive a pension from state or local government, where employees often are not covered by Social Security. People who worked part of their careers outside of Social Security will look "poor" from Social Security's point of view, since the program can't "see" their non-Social Security earnings. For instance, someone who worked every year at the economy-wide average wage but spent half his career in non-covered employment would look to Social Security as someone who earned half the average wage over his working lifetime. Likewise, some individuals will apply for spousal benefits based on their spouse's Social Security contributions, even if they receive a pension benefit themselves from state/local employment. The WEP/GPO provisions can reduce Social Security benefits for people with state/local pension income to prevent over-generosity or double-dipping. But for these provisions to be implemented correctly depends on SSA knowing the pensions people are actually receiving from non-covered employment. The SSA IG's report says that in a significant number of cases SSA's information is incorrect and therefore it overpays these individuals. The report estimates that around 8,500 public sector retirees are overpaid each year, by an average of almost $2,500 per person. This is pretty big money, considering that the typical Social Security retirement benefit is only around $14,000. The IG found that benefits were paid correctly in around 90 percent of cases, but in one case out of 20 errors were made. Sometimes these errors were inadvertent, while in other cases it appears that beneficiaries did not disclose – as they should – that they were receiving pension income from non-covered employment. One reason for this, I think, is that neither SSA nor public employers nor public sector unions do a particularly good job explaining to affected individuals why their benefits might be reduce. As a result, public sector retirees view the WEP/GPO provisions as unfair and often get very upset about them. This can't be conducive to getting accurate information voluntarily from these individuals. On Tuesday, July 27, 2010, the Savings and Retirement Forum will be held at Fidelity Investments (325 7th street, NW on the 6th floor) [Directions here], at 8:30am. Fidelity Senior Vice President for Policy Development and Market Planning Pamela Everheart will present her paper "Savings Rates in the U.S. — a Look at the Data"
Defenders of Social Security are taking steps to alert or, depending on one's point of view, alarm the public about possible changes to the program. The National Commission on Fiscal Responsibility and Reform, appointed earlier this year by President Obama, is expected to address Social Security and other major sources of federal red ink in recommendations late this year. Enormous budget deficits have raised both sincere and politicized concerns that spending cutbacks are unavoidable, and that no programs should be considered off the table when considering changes. Specifically, Moeller cites a poll commissioned by the National Committee to Preserve Social Security and Medicare, which purports to find that Americans would rather fix Social Security by raising taxes than by cutting benefits. "Some people have proposed significant changes to Social Security, including cutting benefits, raising the retirement age, and increasing taxes in order to help reduce the national deficit. Do you think that policy makers in Washington should significantly change Social Security to reduce the national deficit or should they leave Social Security alone and look at other ways of reducing the deficit?" One of the current arguments from the left is that Social Security isn't contributing to the current deficit (which is true) and therefore we shouldn't cut Social Security. If they said, 'We shouldn't cut Social Security today' I'd be on board, but in the future Social Security will be a big contributor to the deficit and so we should consider benefit levels in that context. In other words, the National Committee's poll question is different from something like "Social Security faces a long-term financing shortfall. Would you rather address this shortfall by increasing taxes or reducing benefits?" I have no idea how Americans would answer that question, but it's closer to the truth about the choices Americans face. The Dallas Morning News reports that Rep. Sam Johnson, who is the ranking Republican on the House Social Security Subcommittee, is working on a plan to restore the program to long-term solvency. Republican Rep. Sam Johnson of Plano joined a growing number of prominent lawmakers Thursday pushing Social Security benefit cuts as a way to shore up the entitlement program's teetering financial future. Johnson cautioned that any proposals should not affect current or soon-to-be recipients, but he said that scaling back some Social Security benefits was more sensible than continuing to increase payroll taxes. I have an article in The American, AEI's online magazine, looking at when New Jersey's public pension funds might run dry. Answer: sooner than you'd think (or like). Check it out here. I'm interviewed by Chuck Miller of ProManage regarding some research I'm doing on the effectiveness of the Social Security Statement for the RAND Financial Literacy Research Center. You can read the interview here. Writing in Forbes, Jagadeesh Gokhale of the Cato Institute and former Treasury official Mark Warshawky – both members of the Social Security Advisory Board – argue that the Social Security Trustees Report, which has been delayed from its traditional March release date, should be issued immediately. 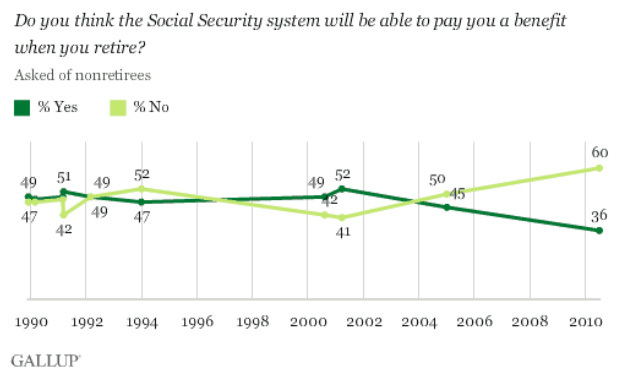 The piece includes an interesting discussion of how health reform might affect Social Security's finances. Roundtable discussion: Should we act now or later to fix Social Security? On July 1st I took part in a panel discussion on Capitol Hill that started with remarks from Rep. Paul Ryan (R-WI), the ranking Republican on the House Budget Committee, followed by a panel consisting of me, Bill Gale from the Brookings Institution and Norm Ornstein from AEI. AEI's Kevin Hassett moderated. The video is now available from C-SPAN here. A payroll tax cut to stimulate the economy? In the New York Times, former Senate Finance Committee staffer Donald Susswein writes that policymakers should enact a temporary reduction in the Social Security payroll tax to help stimulate the economy. 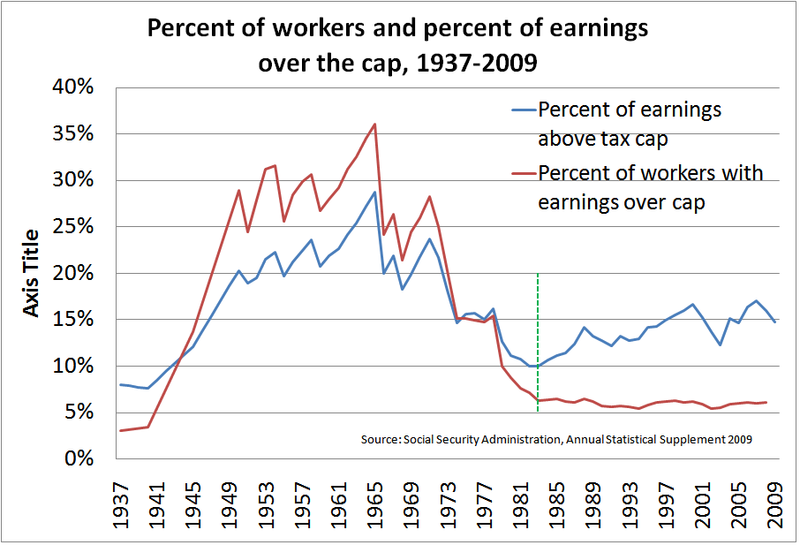 To stimulate the economy now with no long-term increase in government debt, Congress should therefore temporarily exempt a portion of wages from the Social Security taxes imposed on workers; at the same time, those exempted wages would not be credited in computing that worker's future retirement benefits. For example, a 40-year-old earning $50,000 and paying annual Social Security taxes of about $3,000 could see those taxes cut to about $2,000. The added $1,000 in his paycheck, along with similar amounts for other workers, could be a huge stimulus to the economy. In the future, of course, there would be a price to pay: the growth in that worker's retirement benefits would be slightly reduced — much as if he had taken off four months without pay. I've been skeptical of payroll tax cuts as economic stimulus in the past, though I'd certainly favor them over the $800 billion or so of stimulus we did pass, which hasn't exactly seemed to jump start the economy. (Yes, I know there's a counterfactual – things could have been worse.) To the degree a payroll tax cut is "paid for," as Susswein's would be, I don't think it would be a huge problem to try it. That said, things that start out "paid for" often end up significantly less so once Congress gets their hands on them. The New York Times Robert Pear reports – very elliptically, I think – on a conflict between the Commissioner of Social Security Michael Astrue and SSA's chief actuary, Steve Goss. A rift has developed between the Social Security commissioner and the agency's chief actuary, causing members of Congress to worry about possible interference with the work of the actuary's office just as lawmakers begin hearings on the future of Social Security. In interviews and in letters to the administration, lawmakers said they relied on the actuary, Stephen C. Goss, for objective analysis of proposals to change Social Security. And they made clear that he should not be reassigned or demoted as Congress prepared for a re-examination of the program, now celebrating its 75th anniversary. It's a bit of an odd article because it's never really very clear what exactly the conflict is over. Maybe a personality clash, maybe differences over Goss's willingness to talk about Social Security reform (albeit always from an actuarial perspective, not in terms of pushing solutions of his own). The reporting is hamstrung by the fact that SSA won't say much about personnel matters, so we're left with Members of Congress writing letters to support Steve Goss yet it's not clear what the conflict is really about. Having been at SSA and worked with Commissioner Astrue and Steve Goss for a number of years, I have some vague ideas about the possibilities, but not enough that may opinion is worth much on an obviously sensitive matter. My general take, though, is that the actuaries should be as independent as possible, given the importance of their work and the temptations for elected officials to pressure them to produce given results. (I have not heard that any such pressure was brought to bear by Commissioner Astrue, and in any case I'm reasonably confident that this conflict doesn't really hinge on Social Security reform issues.) That said, the actuary's office should also be as transparent and responsive as possible. The Commissioner or elected officials can't and shouldn't tell the actuaries how to produce their estimates, but there should be as much clarity as possible in terms of how the estimates were arrived at. 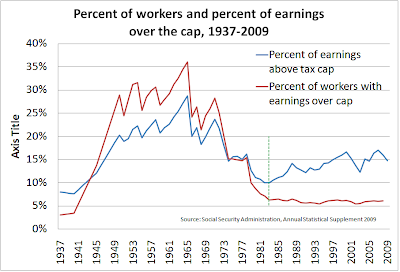 Should we lift the payroll-tax ceiling to fix Social Security? Over at ThinkProgress, Matt Yglesias argues that a sensible solution to Social Security's long-term funding shortfalls would be to eliminate the so-called "tax max," the $106,800 maximum earnings on which Social Security's 12.4 percent tax is levied and upon which benefits are calculated. In other words, individuals would pay taxes and earn benefits based on their total earnings, no matter how high. According to the Social Security Administration's (SSA's) Office of the Actuary, this step—if implemented immediately—would eliminate around 95 percent of the long-term "actuarial deficit." Yglesias calls eliminating the tax max "a very reasonable response to the fact that over the past thirty years the share of national income accruing to very high income individuals has gone up dramatically." The Congressional Budget Office released a new analysis of a number of options to improve Social Security's long-term financing. What's really helpful about the new paper is that it shows how policy options affect both the program's solvency and the level and distribution of taxes paid and benefits received by different types of individuals. Without knowing both the financing end and the effect on participants it's hard to put together a plan that reflects your priorities for the program. It's definitely worth checking out for anyone interested in reform, particularly in light of the possibility that President Obama's fiscal commission may recommend changes to Social Security.